 Pumpkin gummies for Halloween, or a Thanksgiving candy cornucopia. Photo and recipe from Hannah Kaminsky | Bittersweet Blog. Don’t like gummies? You can melt white chocolate and add orange food color (photo Amazon). 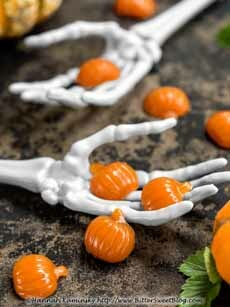 With a $4.99 plastic mold, you can make your own Halloween Thanksgiving gummy candies for snacking or favors. The finished product is 1-1/2″ square by 1/2″ deep. Our colleague Hannah Kaminsky shares her simple recipe with us. 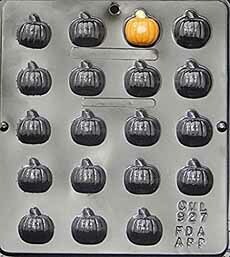 She used four plastic pumpkin molds (photo #2, $4.99 each with free shipping). Alternatively, you can line an 8 x 8-inch baking pan with foil and cut gummy squares. Just be sure to lightly grease the foil before proceeding. 1. WHISK all of the ingredients in a small saucepan until smooth, and set over medium heat. Stir gently but consistently: You should start to feel the mixture thicken almost instantly. 2. CONTINUE scraping the bottom and sides of the pan as you stir to prevent sticking or burning, until the mixture is sticky but spoonable. It will be so dense that it doesn’t quite come to a boil, but should bubble up around the edges quite a bit. set; at least 20 to 30 minutes. 4. POP the pumpkins out of the molds and trim away any excess, if necessary. If they don’t mysteriously disappear first, the candy will keep in an airtight container in the fridge for 5 to 7 days.